Andrew was a small and ferocious Cape Verde hurricane that wrought unprecedented economic devastation along a path through the northwestern Bahamas, the southern Florida peninsula, and south-central Louisiana. Damage in the United States is estimated to be near 25 billion, making Andrew the most expensive natural disaster in U.S. history. The tropical cyclone struck southern Dade County, Florida, especially hard, with violent winds and storm surges characteristic of a category 4 hurricane on the Saffir/Simpson Hurricane Scale, and with a central pressure (922 mb) that is the third lowest this century for a hurricane at landfall in the United States. In Dade County alone, the forces of Andrew resulted in 15 deaths and up to one-quarter million people left temporarily homeless. An additional 25 lives were lost in Dade County from the indirect effects of Andrew. Albert Einstein was a German physicist who lived between 1879-1955. His specific and general theories of relativity, theory of Brownian motion, work in quantum physics, statistical mechanics, and on the photoelectric effect, make him the most well-known scientist of the twentieth century. 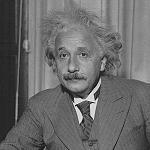 lbert Einstein was a German physicist who lived between 1879-1955. His specific and general theories of relativity, theory of Brownian motion, work in quantum physics, statistical mechanics, and on the photoelectric effect, make him the most well-known scientist of the twentieth century.